Because sepsis is characterized by nonspecific symptoms and can progress quickly—with fatal results—biomarkers that can characterize the condition are dearly needed. Ultimately, multiple biomarkers may serve to characterize different aspects of the disease. With an eye toward this multibiomarker possibility, researchers at Lund University and the University of Zurich have been using mass spectrometry to measure hundreds of proteins and reveal protein patterns that could be analyzed to determine the severity of a patient’s sepsis condition. Their technique, which requires just a single blood sample, could also be used to show which patient organs have sustained sepsis-related damage. The researchers, led by Lund University’s Johan Malmström, Ph.D., published their results January 6 in the journal Nature Communications, in an article entitled, “Large-scale inference of protein tissue origin in gram-positive sepsis plasma using quantitative targeted proteomics.” The work is, essentially, a protein-mapping project. 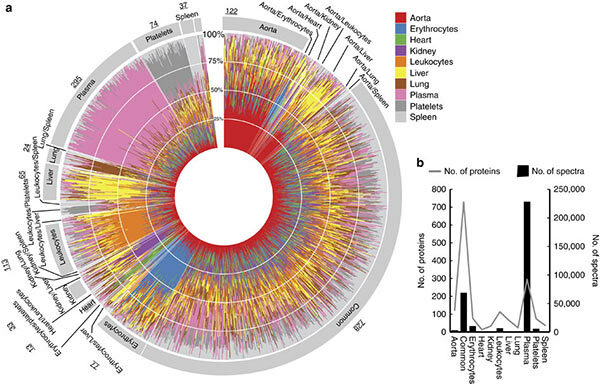 It shows how the researchers constructed a comprehensive protein tissue atlas from cells and highly vascularized organs using shotgun mass spectrometry.